A Gram-negative, non-motile and rod-shaped bacterial strain, designated RA2-3T, was isolated from a sea squirt (Halocynthia roretzi) collected from the South Sea, Korea, and its taxonomic position was investigated by using a polyphasic approach. Strain RA2-3T was observed to grow optimally at 25 °C, at pH 7.0–7.5 and in the presence of 2 % (w/v) NaCl. Strain RA2-3T exhibited the highest 16S rRNA gene sequence similarity values to the type strains of Litoreibacter meonggei (95.7 %), Planktotalea frisia (95.6 %), Thalassobius gelatinovorus (95.5 %) and Pelagicola litoralis (95.4 %). A neighbour-joining phylogenetic tree based on 16S rRNA gene sequences revealed that strain RA2-3T clustered with the type strains of Planktotalea frisia, Pelagicola litoralis, Pacificibacter maritimus and Roseovarius marinus. Strain RA2-3T was found to contain Q-10 as the predominant ubiquinone and C18:1 ω7c as the major fatty acid. The major polar lipids detected in strain RA2-3T were phosphatidylcholine, phosphatidylglycerol, one unidentified aminolipid and one unidentified lipid. The DNA G+C content of strain RA2-3T was 52.9 mol%. 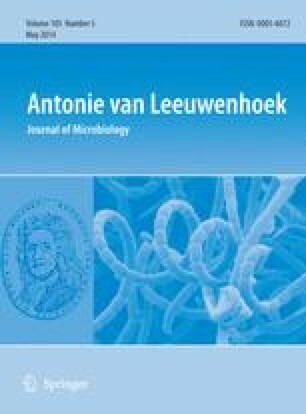 On the basis of the phylogenetic, chemotaxonomic and phenotypic properties, strain RA2-3T is considered to represent a new genus and species within the family Rhodobacteraceae, for which the name Halocynthiibacter namhaensis gen. nov., sp. nov. is proposed. The type strain of H. namhaensis is RA2-3T (=KCTC 32362T=NBRC 109999T). The online version of this article (doi: 10.1007/s10482-014-0142-3) contains supplementary material, which is available to authorized users. This work was supported by Grants from the National Fisheries Research and Development Institute (NFRDI) and Program for Collection, Management and Utilization of Biological Resources (Grant NRF-2013M3A9A5075953) from the Ministry of Science, ICT & Future Planning (MSIP) of the Republic of Korea.